Fragrant flower petals on display in Grasse, France. During the Renaissance, a generalized fear of water kept even the wealthiest of people from smelling their best. Between the lack of bathing and a thriving (yet pungent) leather business the town of Grasse, France was in need of an odor concealer. According to local legend, a tanner presented a pair of scented gloves to Catherine de Medici, the Queen of France from 1547 to 1559, and the perfume industry was born. Known as the world’s capital of perfume, Grasse is home to three factories that produce over two-thirds of France’s natural aromas for perfume and food flavorings. Grasse’s location provides the ideal climate for an overabundance of jasmine growth, a key ingredient in many perfumes. The flower was brought to southern France by the Moors in the 16th century and continues to thrive throughout the region. 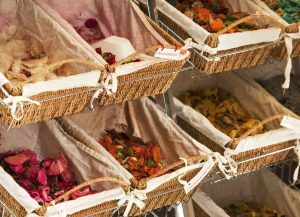 Tourists can visit the Fragonard, Molinard, and Galimard perfumeries, which offer free tours that explain the processes of producing perfume.Visitors can even make their own bottle of eau de parfum or eau de toilette! Expert perfumers agree that the quintessential French scent can be captured in a series of classic fragrances. Discover three of France’s most elegant and renowned perfumes. Originally released in 1921, Chanel No. 5 is the first perfume launched by French couturier, Coco Chanel. Chanel felt that the heavy jasmine scent and animal musk tones epitomized the flapper and the liberated spirit of the 1920s. Characterized as vanilla, powdery, and sweet, Guerlain Shalimar is considered an iconic French perfume. Whether you’re wandering through Paris or Bordeaux, you’re sure to catch a whiff of this scent. A bold, sophisticated scent, Yves Saint Laurent Paris embodies a City seen through rose-colored glasses. The perfume is flowery, feminine, and very French. Experience an exhilarating French adventure on the Euro Focus, Great Escape, Cosmopolitan, Explorer, and Continental tours. It’s never too late to get a taste of a multitude of exciting cultures! This entry was posted on Wednesday, September 20th, 2017	at 11:37 am	. You can follow any responses to this entry through the RSS 2.0	feed. Both comments and pings are currently closed.